Lightly oil a rimmed sheet pan with 1 tbsp olive oil. Bring a medium pot of salted water to a boil. Add the Fregola Sarda and cook until just before it is al dente, about 11 minutes. Quickly drain through a fine-mesh sieve and spread evenly on the oiled sheet pan. Set aside to cool to room temperature. In a large skillet, heat 1 tbsp of olive oil over medium heat. Add the onion and cook, stirring occasionally, until transparent, about 5 minutes. Add the zucchini and cook until the zucchini is tender, about 5 minutes. Add the shrimp and cook, tossing until they just turn opaque, about 3-4 minutes. 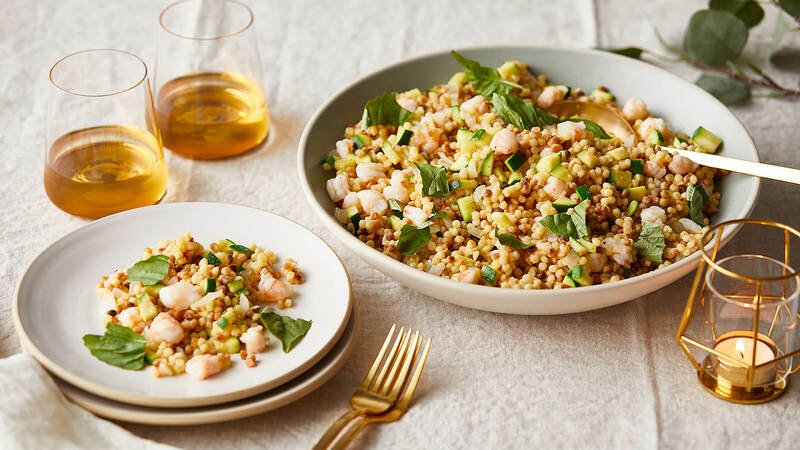 Season with salt and transfer the shrimp-zucchini mixture to a serving bowl. Add the Fregola Sarda one handful at a time, using your hands to mix well. Add the remaining olive oil as you go along. Season with salt, pepper, and lemon juice. Fold in the basil leaves and mix well, always with your hands. Serve at room temperature.